FRAMINGHAM – Senior outfielder Dayna Marchant went seven-for-seven with seven runs scored and four RBI as the Framingham State University softball team swept Massachusetts State Collegiate Athletic Conference (MASCAC) doubleheader against MCLA at Maple Street Field. The Rams took both games by a score of 11-2 in five innings. With the wins, the Rams even their season mark at 8-8 and are now 2-0 in the MASCAC. The Trailblazers fall to 2-10 on the year and are now 0-2 in the league. The Rams got on the board in the top of the first as Marchant led off the game with a double and advanced to third on a groundout. Senior Megan Downing followed with a double to right center scoring Marchant. The Rams added to their lead with a pair of runs in the top of the third. Downing delivered an RBI single to deep center that scored Marchant, who had singled. Senior Anna Dziok followed with a sacrifice fly plating sophomore Mycala Moody who had walked. In the top of the fourth the Rams extended their lead to 7-0. Freshman Camille Desrochers reached on an infield single and stole second. Marchant plated Desrchers with her third base hit of the game. Junior Kayla Finacchiaro, a Natick High graduate, reached on an infield single scoring a run and Dziok followed with a two-run single. The Rams added four more in the top of the fifth to lead 11-0. Junior Lauren Salisbury plated two runs on a triple and Marchant added an RBI single and Moody an RBI double. MCLA pushed across two runs in the bottom of the fifth but were defeated in the run-rule shortened game. The Trailblazers loaded the bases with no outs on a walk, an infield single from Francesca Belli and an error. Junior Kaitlyn Berghela followed with a single to right scoring a pair of runs, but the Rams were able to retire the next three to end the game. Marchant went four-for-four in the opener with four runs scored and two RBI, while Desrochers went three-for-three with two runs scored. Downing also recorded three hits with a run scored and two RBI. Junior Kelsi Gunarathne (Providence, RI) earned the victory in game one going three innings and allowing no runs on two hits with five strikeouts. Freshman Marissa Vellucci (Tyngsboro, Mass.) worked two innings of relief and allowed two runs, one earned, on two hits. Sophomore Morgan Watson took the loss for the Trailblazers going five innings and allowing 11 runs on 16 hits. In game two, the Rams once again got on the board in their first at bat of the game. Marchant walked to lead off the contest and scored on a Downing single. Finacchiaro doubled home Downing for the 2-0 lead. In the top of the second the Rams pushed five runs across to lead 7-0. Salisbury and Marchant delivered RBI singles, Finacchiaro added another RBI double and Dziok plated a run with a sacrifice fly while Moody pushed home a run on a groundout. Moody added her second RBI of the game in the top of the third to give the Rams an 8-0 lead. The Rams received RBI singles in the top of the fifth from Marchant and Vellucci, while sophomore Kaylea Sherman drove in a run as well. MCLA tallied a pair of runs in the bottom of the fifth to reach the final margin. Berghela singled and an error in the outfield allowed the first run to score, while Kaylyn Holliday added an RBI single. Freshman Grace Caughey earned the victory for the Rams in game two going three innings and allowing no runs on one hit with two strikeouts. Freshman Samantha Feinstein took the loss for the Trailblazers going two innings and allowing seven runs, six earned, on seven hits. 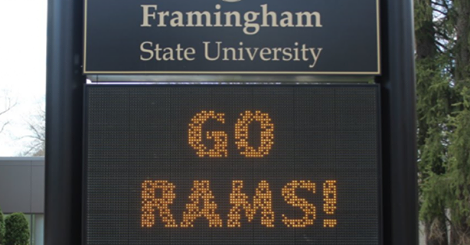 The Rams are back in action on Tuesday afternoon when they host Emmanuel at 4 p.m.
As Massachusetts’ premier state college, Framingham State University offers prepared and motivated students a wide range of challenging undergraduate and graduate programs. Located just 20 miles from Boston, the university offers many options for students to engage in real-world learning both on its quintessential New England campus and in Boston and its thriving MetroWest region.